To meet Britain's need for cargo capacity during the first world war, the Shipping Controller arranged for the construction of several types of "War Standard" ships. Bardic was originally one of these, and one of three "G" type War Standard ships purchased by White Star after the war ended. (Gallic (II) and Delphic were the other two.) Built by Harland & Wolff, Belfast, she was launched as War Priam in December 1918, but during her fitting out she was sold to White Star and renamed Bardic. A cargo carrier with no passenger accommodations, Bardic made her maiden voyage from Liverpool to New York on 18 March 1919. From June 1919 until April 1921, Bardic was under the management of the Atlantic Transport Line, and ran on ATL's London-New York service. In May 1920, Bardic returned to White Star, on the line's Australia service. She remained on that service for her entire White Star career, which lasted until 1925. For about a month of that time (31 August to 29 September 1924), she was stranded on Stag Rock, Lizard, having gone aground just a few hundred yards from where Suevic had grounded in 1907. She suffered severe bottom damage, but was returned to service later in 1924 after repairs were made, initially in drydock at Falmouth and then at Harland & Wolff. 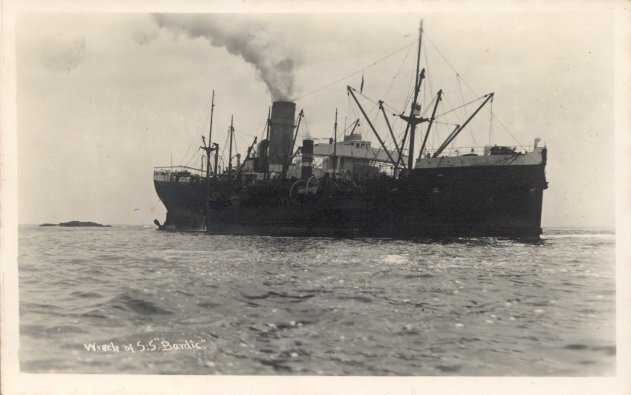 In 1925, Bardic was sold to the Aberdeen Line, which renamed her Hostilius and, in 1926, Horatius. She was again transferred in 1932, this time winding up with Shaw, Savill & Albion, and renamed Kumara. Finally, she was sold to John Latsis of Piraeus in 1937, and renamed Marathon. A convoy straggler proceeding at her own pace, Marathon was sunk by the German battlecruiser Scharnhorst on 9 March 1941, northeast of the Cape Verde Islands. However, her radio warnings permitted the rest of her convoy to escape.